1. Break down the new job into its basic elements. Match these elements to the time for similar elements in the table. 2. Match these elements to the time for similar elements in the table. 4. 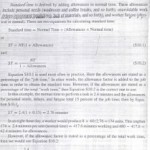 Add element times together and add delay and fatigue allowances as specified by company policy for the given class of work.